The fatality occurred at the corner of Main South Rd and Foremans Rd, Islington, just after 10am on Monday, a report said. About 200 crashes have occurred on the road near near the Devil’s Staircase since 2000, including six fatal and 12 serious [/critical] collisions, the report said. From missing to death under “no suspicious circumstances” in under 24 hours! Second body found since yesterday! Thieves have broken into a Christchurch charity’s food bank stealing about $8000 worth of food. As usual, police are clueless. A 49-year-old man was hit and killed by a truck around 7:20pm last nighgt, Friday 3 August, on State Highway 2, Maramarua. The two people who were violently killed in the crash on Sandy Road, Meeanee, on Thursday 2 August were 31-year-old Janina Pascoe [nationality undisclosed] and 17-year-old Matiu Whatarau of Hastings. Third victim, a teenager, remains in serious condition in hospital. A 50-year-old man was crushed to death in a motor vehicle incident in a car park on Tawa St, Hamilton about 8.20am. A fatal and cyclist occurred at 7:20pm. A cyclist was violently killed in a crash involving a car on SH 2 in Maramarua, Waikato, Friday evening. A male cyclist has been taken to hospital in a serious condition following a crash on Huka Falls Road this morning. WTF: Money for nothing and chicks for free!! Govt-funded English language school director Bo Han indecently assaulted employee, and keeps his job! Bo Han, the Chinese director of a government-funded English language school who was convicted of indecently assaulting an employee, remains in the job. “Bo Han, manager and owner of the Waikato Institute of Education in Hamilton, was convicted in November last year on one of two charges of indecent assault. Judge Philip Connell, you’re a horse’s arse, among other equally filthy, unpleasant things! When the law fails so abysmally, a few good men should respond. “Hamilton CIB are investigating two indecent assaults that occurred in the staff carpark at Waikato Hospital. “The two incidents occurred yesterday, Friday 3 August, the first one around 4pm and the second incident not long after. “The offender is described as Caucasian, approximately 16 years of age and approximately 183cm (6 foot) tall. No road fatality reports allowed by police today, as of posting, despite several serious crashes reported locally. Tuesday’s UPDATE: Only six of the road/rail fatality reports allowed by police since yesterday, as of posting, despite numerous serious crashes reported locally. IF we didn’t write this, at least five more people killed on NZ roads would remain statistically resurrected! Will this force NZ’s Monstrosity of Transport (Minitru) into cancelling the latest five cases of statistical resurrections? Water, water… our frigging kingdom for water! Stop the sale of billions of litres of Canterbury’s purest water! A Chinese man who was a “seasonal worker” [slave worker without rights] had just finished work on a Central Otago orchard when he was killed close to his seasonal-workers’ shack. The victim, who came from Hong Kong, was hit by a car on State Highway 8, near Airport Rd, about 5.45pm on Thursday, said a report. He was at least the third Chinese national to be killed on New Zealand roads in under two weeks. Dead Chinese woman sister of the Christchurch earthquake victim Didi Zhang? At least three people were injured, one critically, in a two-car collision late Thursday near Lyell, about 6km north-east of Inangahua Junction and close to the Iron Bridge across the Buller River, said a report. “The driver of the motorcycle” was killed in the crash, police said. Canterbury Police has released the names of the three teenagers killed in a crash in Leeston, Canterbury on Boxing Day, December 26. They were Lily Frances Moore, Samuel James Drost, and Cole Troy Hull. All were 15 years old. A search operation is underway for a hunter, near Dunsdale in Southland, after he failed to return from a hunting trip. Alex Petersen, 14, went missing from his Blenheim home on December 19. New Zealand Police receive more than 8,000 [more likely 10,000 – 12,000] missing persons reports every year. They allege 95 per cent of those are found within 14 days, with more than half located within the first two days. Even if their figures were correct, the remaining 5 percent of the missing still add up to at least 400 people each year. The Australian family decimated in the deadly car crash had just arrived in New Zealand on Monday and had been on their way to visit relatives for the holidays. Australian violinist Stephen Phillips and his two stepsons, aged 12 and 14, were killed instantly when the [most probably defective] rental car they were travelling in collided with a truck on State Highway 1 at Huntly on Monday afternoon. The boys’ mother was rushed to hospital in a critical condition along with her daughter Tessa, 9, who barely survived the crash. “There’s bits of car scattered hundreds of metres from where the crash happened. It’s everywhere, as far as the eye can see,” said an eye-witness. Phillips, 54, was First Violinist with the Queensland Symphony Orchestra (QSO) and his partner, Belinda Williams, 40, was a casual guest musician for the Queensland Symphony Orchestra and played the viola. A 46-year-old woman was killed after being hit by a truck and trailer unit while walking along State Highway 1 at Kinleith in the earlier this morning. How Many Visitors Killed Since 2000? About 3,500 overseas visitors, international students, foreign workers, recent emigrants and refugees have lost their lives and 20,000 others seriously injured in New Zealand since year 2000. The number of road fatalities reported [leaked] on Queen’s Birthday Weekend has now climbed to at least 11, after three more people were killed near Dragaville, in Northland. “A 4WD carrying six people crashed into a tree at about 6.45pm on the corner of Bayleys Coast Rd and Baylys Basin Rd, near Dargaville”, killing at least three of the occupants, with three others sustaining serious (!) injuries, said Fire Communications shift manage. The manipulated road toll for previous years were as follows. In 2013, the road toll during Queen’s Birthday Weekend was completely suppressed by the authorities. In fact, a strict campaign of news censorship by the police/government meant that only 253 road fatalities would be reported during the entire year. The number of road fatalities reported [leaked] on Queen’s Birthday Weekend climbed to eight earlier this afternoon after a motorbike rider was killed in a collision with a car in Huntly, Waikato. Sixth [reported] person killed: A man was killed in a single vehicle crash on Dun Rd, near Kaingaroa Forest, east of Taupo Sunday afternoon. Fifth [reported] person killed: A man was killed and four others including a mother and her baby were injured in a two-vehicle collision in Northern Wairarapa, near Mt Bruce, just before noon Sunday. And in Mangere East about 9.15am, two people had to be cut from a car after it crashed into a tree on Ferguson St. A 16-year-old is in a critical condition and a 9-year-old and another person are seriously injured. Four people were in the car. Fourth [reported] person killed: A person was killed when three vehicles collided on Omihi Rd in the Greta Valley, north of Christchurch Saturday evening. Four others were injured in the crash, which involved a truck and two other vehicles. Third [reported] person killed: A motorcyclist was killed after colliding with a parked vehicle in the Auckland suburb of Flat Bush. Second [reported] person killed: A person was killed in a two-car collision on State Highway 3 near Te Kuiti. Two others were injured, one seriously. First [reported] person killed: A Kaikoura man was the first to be killed on our roads this holiday weekend. 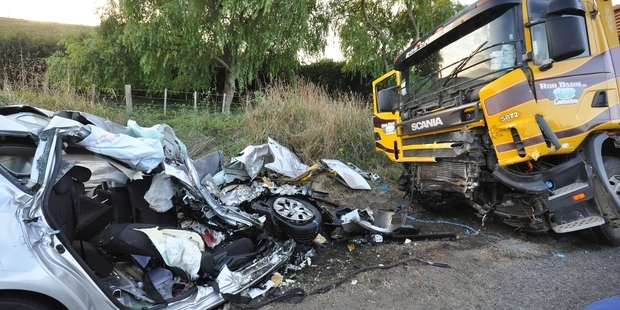 Several others were badly injured in the four-car crash on State Highway 1 north of Dunedin just before 6pm on Friday. Remi Morilleau, 27, was killed in a three-car crash in Northland on Christmas Day just hours after arriving in New Zealand. The victim, a native of Nantes, had arrived in Auckland from Melbourne with his partner on Christmas Day. They lasted about 4 hours from arrival, travelling just 160km in New Zealand. RIP. 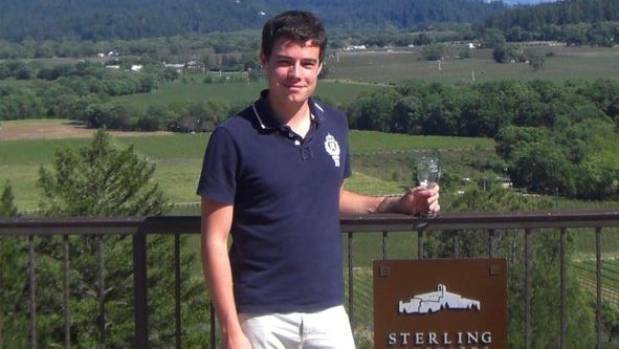 Frenchman Remi Morilleau, 27, of Nantes, who was killed on his first day of a holiday in New Zealand, was reportedly the son of the Bernard Morilleau, the mayor of Sainte-Pazanne, a small town southwest of Nantes. He was with his partner, driving a rental car between Oakleigh and Puwera on SH1 when his life was cut short. They had survived a holiday in Australia, only to lose at NZ Roulette. The victim’s partner was seriously injured, but her injuries were probably not The victim’s partner was seriously injured, but her injuries were probably not life-threatening, police said. The crash occurred just north of where an Englishman was killed in a head-on collision near the intersection of Totara Rd and SH1 at Oakleigh on November 4, within 10 hours of arriving in NZ. 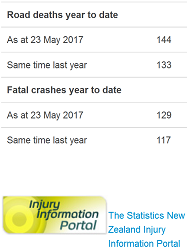 Based on the information received from our friends throughout the country and the blog’s statistical model, the moderators believe at least 1,280 crashes have occurred on NZ roads, resulting in about 40 fatalities and at least 650 injuries, since the official holiday road monitoring period began at 4pm on 24 December. Police can confirm that all [36 people] involved in today’s crash between a bus and a car on SH73 at Otira Gorge are tourists. Three were travelling in the car and the remainder on the bus. It’s believed that the tourists in the car were Europeans, and those on the bus were Asians. t least four cars were severely damaged in two separate but linked crashes and “multiple injuries” were reported. One of the vehicles involved appeared to have foreign backpackers on board. Earlier in the evening a car flipped on the Northern Motorway. The driver of the car suffered serious injuries after he was thrown from a window of the car onto the road. In Apiti, a 28-year-old Feilding man suffered multiple serious injuries in a car accident. WHY are so many overseas visitors killed on NZ roads? How many of these cars end up being driven by overseas visitors? About 60 per cent of second hand cars imported from Australia are written-off, according to The New Zealand Transport Agency, says a report. Since 2011, on average, 3 foreigners have been killed in New Zealand every 4 days, many of them in vehicle crashes. We believe, most of the unnecessary deaths occur because a large percentage of vehicles driven on New Zealand roads are defective and road unworthy. Canterbury Police said SH1 south of St Andrews has reopened following a fatal crash involving two vehicles shortly after 2.45pm this afternoon (10 April 2015). No details of the deceased has been released. One person was in a critical condition and was taken to Christchurch Hospital by helicopter. Another person in a critical condition was taken to Timaru Hospital. Three other people have been taken to Timaru Hospital with serious injuries, police said. Police were called to a sudden death at the Copthorne Hotel in Auckland this afternoon (10 April 2015). 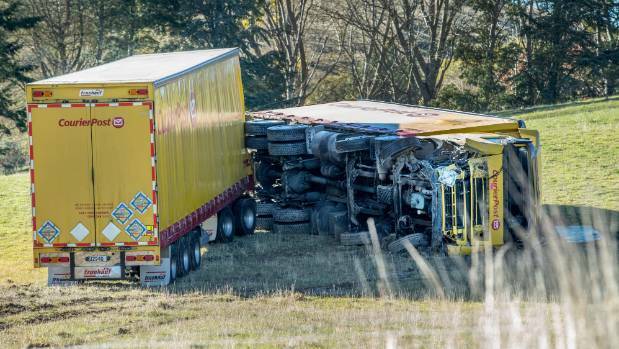 Canterbury Police say the victim of the fatal crash south of the Rangitata Road Bridge involving a Honda Civic and a stock truck and trailer unit on 29 March 2015 was a 39-year-old Iyad Hassan Mohammad Abunahleh who was originally from Jordan. Police deployed a radial sonar at Lake Coleridge today during the continued search and recovery operation for the kayaker who went missing on Saturday afternoon (4 April 2015). The missing man’s [wealthy family,] who are being supported by the NZ Army and Canterbury Police, have asked for privacy while the search continues. A 53-year-old man was killed in a crash in Whangarei Thursday night (9 April 2015). The man was riding a motorcycle on Riverside Drive towards Onerahi when he collided with a car about 6.20pm at the intersection with Mackesy Drive, police said. A fatal head-on collision between a truck and a car on a busy Waikato Highway, 1km south of the Wharepoa Rd intersection, has killed one person, believed to be the driver of the car, and left a second person in a critical condition. Two men were killed in separate road crashes in the Bay of Plenty this week. Lawrence Mio Kerr, aged 51, from Torere near Opotiki, the driver of a fully laden logging truck, was killed when the truck rolled. 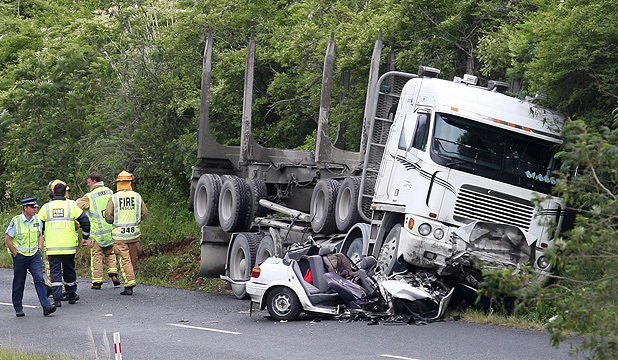 This crash occurred shortly after noon on Tuesday, 7 April on State Highway 35 near Waihau Bay. Motorcyclist Clinton Hunter, aged 26, was killed in a crash at approximately 6.55pm on Wednesday, 8 April on Carmichael Road, Bethlehem, Tauranga. Farm owner who had been spraying weeds was killed after he rolled his quad bike into a drain at Hodders Road, Carterton, and became trapped underneath it. A 28-year-old man, possibly a foreign visitor, was killed in Palmerston North on 7 April 2015. 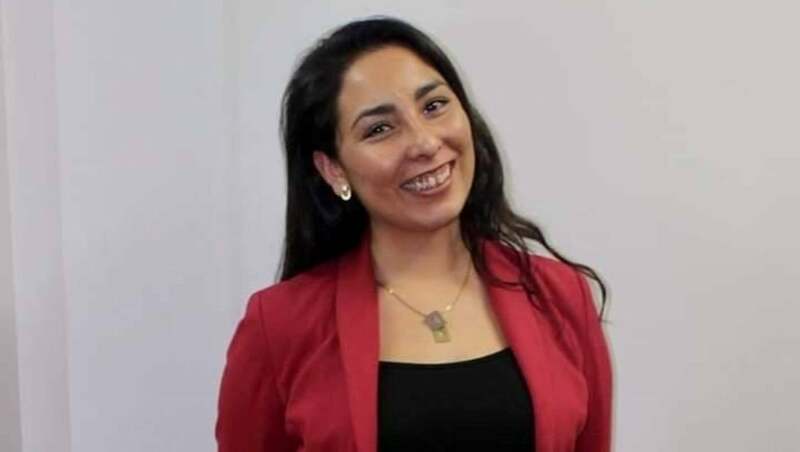 The family of a woman who was killed by an overtaking car while she out jogging is angry because the killer driver (the man who was at the wheel) has escaped a prison sentence.